Named RIO, one would expect a flashy, exuberant, carnivale dance-a-vale rainbow spectacle. One would be wrong. Rather, an uninvolving tale of a rare blue macaw and his intended mate on the run from poachers, while his owner and her soon-to-be mate try to track them down. Cue seen-it-a-million-times face. Jesse Eisenberg voices Blu the parrot, abandoned at birth, raised in a Minnesota bookstore by over-protective Linda (Leslie Mann), so never had the need to fly (a plot point more annoying than adorable). 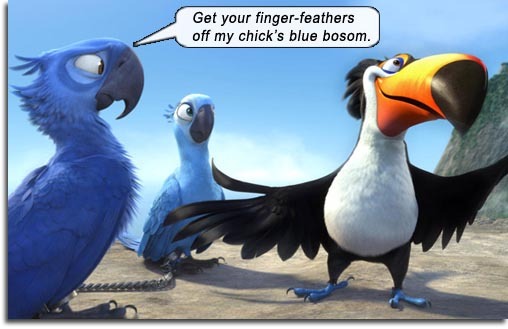 Linda is asked to bring Blu to Rio de Janeiro to mate with a rare female of the species, but she’s an untamed forest macaw named Jewel (voice of Anne Hathaway) who despises the domesticated ineptitude of Blu. Both macaws are subsequently stolen. So begins a fish-out-of-water meets rugged hottie road tale, as Blu and Jewel attempt to escape the poachers the hard way – without flying, due to being shackled together. “Animated kid’s movie” flow chart informs us that rugged hottie will inexplicably fall for the inept male even after he proves himself an embarrassing and inefficient mate. Happens. Meanwhile, a cavalcade of ancillary characters try to provide the much-needed comedy that Blu is not providing by being so annoying, and that Jewel is not providing by being so annoyed with Blu. Jamie Foxx and Will i am are two little sidekick birds, Jemaine Clement is the poachers’ mercenary cockatoo, George Lopez is a friendly frenetic toucan, and Tracy Morgan is a bulldog who won’t stop grossly drooling. Rodrigo Santoro is Jewel’s owner Tulio, the human male set up as analogous mate for the human female Linda. Happens. Flow chart tells us that the poachers will be busted and that Blu will learn to fly when it is most needed (maybe to save his chick’s life? ), and that the cockatoo will get his comeuppance and that we’re in for a big embarrassing song and dance number that portends no poaching will ever happen again until the world ends. Happens. Parrot being so ugly doesn’t help, Eisenberg’s faux Woody Allen stammer is grating, bulldog’s spit is nauseating, and obvious join-the-dots plot is mind-numbing. The under-10s are gonna love this colorful crap. Writers: Carlos Saldanha, Earl Richey Jones, Todd R. Jones, Don Rhymer, Joshua Sternin, J.R. Ventimilia, Sam Harper. Starring: Leslie Mann, Jesse Eisenberg, Wanda Sykes, Jane Lynch, Rodrigo Santoro, Gracinha Leporace, Jamie Foxx, Will i Am, Anne Hathaway, Carlos Ponce, Jemaine Clement, Thomas F. Wilson, George Lopez, Tracy Morgan. You won’t get many laughs from this RIO movie, but I defy you to watch this classic Peter Allen live performance without cracking up.